Let’s play a quick game of guess the year. Udo Jurgens wins the Eurovision Song Contest for Austria with ‘Merci Cherie’, Bobbi Gibb becomes the first woman to run the Boston Marathon, Ian Brady and Myra Hindley go on trial for murder, Jean-Bedel Bokassa takes over as military ruler of the Central African Republic ousting President David Dacko, Star Trek debuts on US TV and of course England wins the World Cup. Hands up with the right answer….correct, 1966. My Great War Film today was also a feature of 1966, although maybe not on the same scale as the ousting of David Dacko. Now, if you’ve read my last review for the woeful ‘What Price Glory’ (1952) you would’ve noted by lack of excitement about what was to come next. I knew nothing about my film today and was expecting something similar to the other light-hearted films of the era such as ‘Shout at the Devil’ and ‘Zeppelin’. I was expecting a bit of slapstick, a threadbare plot, some gurning actor eating up the scenery. I was not expecting an anti-war, absurdist, avant-garde work of art. But that is what I’ve been gifted and my world is all the better for it. 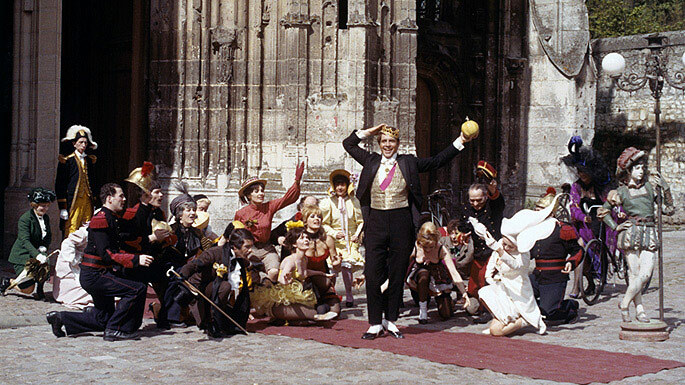 ‘King of Hearts’ is the story of a Scot’s soldier, played by 60’s superstar Alan Bates, who has to go to a small French fortified town towards the end of the war and defuse the jury-rigged bombs set to blow up the place by the retreating Germans. As the Germans retreated the locals got wind that the place was set to blow so they too legged it, forgetting the inhabitants of the local asylum. These loveable nutjobs then take the opportunity to wander around the town, dressing up in the funny clothes left behind by the locals and generally have a hell of a good time without any idea that they’re in imminent danger of being blown to pieces. Alan Bates arrives to find the bombs, gets involved with the mental patients reveries and falls in love. That, ladies and Gentleman, is the plot. And, that is also one of the few failings of the film. At an hour and forty odd minutes long, there’s an awful lot of cellulose feet for nothing much to happen in. A lot of the film is just watching the asylum in-mates having fun, whirling around with umbrellas on their heads, dressing up as generals and prostitutes, pretending to have weddings and parties and generally having a good old knees up while the real world catastrophe of death and destruction (the war) goes on outside the city’s fortified walls. But that does it a dis-service. It’s a bit avant-garde and the extended scenes of reverie are the important part of the story I suppose. I found myself liking the in-mates. They cared for one another and saw the value in living in the present. 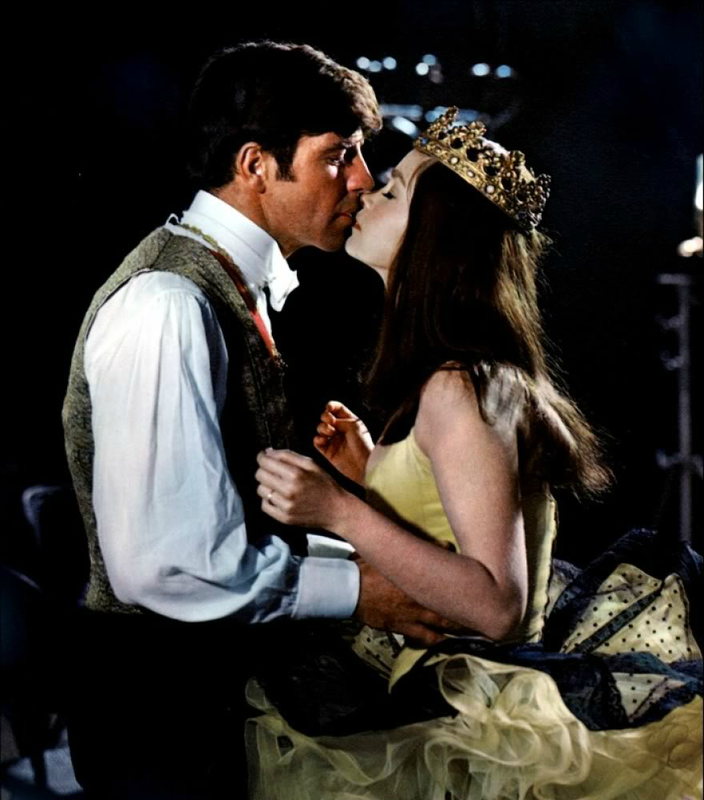 They viewed the Alan Bates character as a king, the titular ‘King of Hearts’. At one point he tries to lead them to safety through the gates and out into a pockmarked old battlefield, the guns can be heard in the background, a slowly rolling drum. They stop at the city wall and call him back. They’re safe here within the walls and to go outside, into the real world, will lead to unpleasantness. There’s really not too much more to bang on about this film other than to say it’s well worth a watch. It’s direct and engaging in its simplicity, it’s a bit long and the light-hearted silliness wouldn’t lend itself to repeated viewing but as a one off, every now and then DVD to pull off the shelf and chuck on when the will takes you, you could do much worse. The film ends with a German and British brigade both marching into and out of the walled city and nearly missing each other with all the pomp and ceremony of their marching practices. When they do spot each other they quickly run and set up in firing formation face to face, separated by mere yards. Face to face they load, aim and shoot. Seconds later they all lie dead on the cobblestones as the third and final round of bullets echo to silence. The asylum inmates watch on as the real insanity of a pastiche battlefield plays out in front of them. I’m so glad that after weeks of watching poorly written, badly shot films starring lacklustre actors I finally have something different, challenging and thought-provoking to get my teeth into. As I said before the whole reason I love films are for moments like these when I find a new film that I love. They don’t need to be perfect, the just need to have something special. So, that’s it. Finally after a drought lasting weeks, nay months, I have a Great War Film that I enjoyed watching. Something to shout from the rooftops. 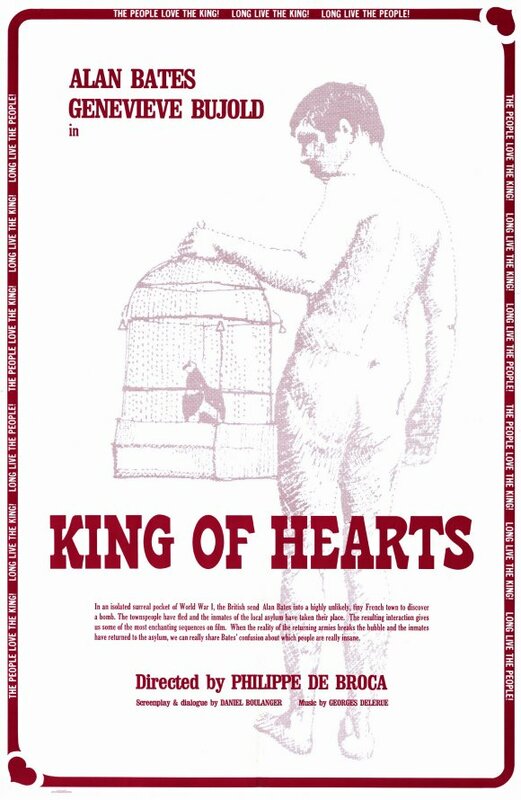 ‘King of Hearts’ has a few problems, is a bit long, doesn’t have too much of a story line, but it does have heart and it puts across its anti-war message in a stark and jarring way. Oh yeah, and it’s French so quite a bit of it is subtitled and it ends with a ‘Fin’. I always like a good ‘Fin’. You just must get your hands on a copy of this. Go here Clicky Clicky and tell them I sent you. Next up I’m off to the seventies with all its pleasures. Shag-pile carpets, George and Mildred, lorry drivers murdering prostitutes, union uprisings and a Great War Film of some kind. Ta.